2010 provide us with the hottest summer and the coldest winters recorded to date. This creates a huge issue for coral reefs around the world. We’ve already discussed the fact that Global Warming Threatens Coral Reefs, but what is harder on the reefs, extreme cold temperature swings or extreme warm temperature swings? This question was studied in a report posted in the Scientific Reports February issue coauthored by Scripps researcher Ralf Goericke of the Integrative Oceanography Division. The studied provided interesting results. 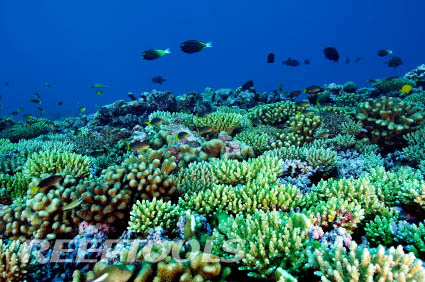 For short periods of extreme temperatures corals could handle warmer waters better than they could cold. But over time the corals on the reefs were able to adjust to the colder climate and were unable to make the adjustment to longer sustained warmer waters. (a) Coral linear extension (mm day−1; mean ± s.e.m.) during days 0–5 (N = 15−19), days 5–9 (N = 10−14), days 9–12 (N = 5−9), and days 12–20 (N = 4−5). (b) Coral dinoflagellate density (x106 cells cm−2; mean ± s.e.m. ; N = 4−5) over time during the experiment.